Those who don’t enjoy cooking find it a chore or too challenging. One reason may be they are intimidated by the recipe. The list of ingredients and/or the actual instructions may be lengthy. To start, browse through the recipe from beginning to end. While it may appear long, the list of ingredients frequently itemizes very common items like butter, cooking oil, salt, pepper, various spices, etc. The instructions may look complicated but, again, simply detail basic procedures like setting the correct stove top or oven temperature are detailed. Get familiar with the methods or processes and get a feel for how easy or difficult they may be based on your abilities. You want to be comfortable and try to cook the dish or you may pass for feel of the dish not coming out just right. If you’re uncomfortable, try cooking it just for yourself and experiment/practice your skills. Even the best chefs have burned toast or cooked a hard boil egg to long...so to speak. Remember, recipes are used by the best cooks around the world. Now that you’ve read through the recipe, you know what’s involved and the ingredients you’ll need. You want to have all the ingredients when you start. It will be very frustrating to start cooking and run out of something simple. You’ll lose your enthusiasm and interest. Make sure you have the right ingredients...and the correct quantities. While you can generally substitute Dijon mustard for spicy brown mustard, you can’t use dry mustard. You don’t want to find out you need 3 cups of chicken broth when you only have a half a cup. As you get more experience with cooking, you’ll learn how easy it can be to substitute and/or adjust quantities. Now….make sure you have the right cookware and utensils. Most recipes will call for a specific type of pot or pan, but rarely is it “exotic” and not something you already have in your kitchen. Basic large spoons, ladles, tongs and “flippers” usually cover what you need. A tip…if you’re using “non-stick” or enamel coated pots and pans make sure you use wooden rubber type utensils so you don’t scratch the coated surfaces. Here’s a recipe that lists nine ingredients but as you read it and see it is very simple, including instructions. Combine all ingredients and heat in a sauce pan. Pour over cooked linguine. Makes 2 servings. Some time ago I decided that if you have to do something several times a day, why not make it a hobby and enjoy it. Cooking can be fun and give you a sense of accomplishment…not to mention a very enjoyable meal for your family or friends. Visit my website@ EnamelCookwarePlus.com for a quality selection of enamel coated cookware that will serve all your cooking needs. If you want to enjoy a gourmet meal using inexpensive cuts of meat then you’ll want to learn how to “braise”. Braising means browning the meat oil and/or butter then slowly cooking in a covered roasting pan. The meat is covered in a liquid which usually includes some combination of water, broth and red or white wine. Cooking time can take from one to several hours as this method is used to tenderize and intensify the flavors in the meat and accompanying vegetables. Despite the time frame, most recipes are usually fairly simple and don’t require any advanced skills. Follow these basic steps and you and your family or friends will thoroughly enjoy the results. Step 2-Brown the meat in some type of fat…olive oil, butter or some combination suggested in the particular recipe. The browning process is intended to add color and flavor enhancement. Frequently, the recipe may call for rolling the meat in flour seasoned with salt and fresh ground pepper. Again….a flavor enhancement. The browning process is done in a Dutch oven or large heavy pot with a lid. The browning step may take 10 -20 minutes to cover all sides of the meat. It only cooks the surface of the meat and the earing locks in flavor. Some tips….the meat should be patted dry and free of moisture or it will “steam” more than brown…don’t crowd the meat so any moisture can escape. Size of the portions, if not whole, should be the roughly the same for even cooking. Step 3-Add liquids. As I mentioned earlier, depending on the type of meat and recipe, you can use wine, water, stock/broth...usually a combination of these liquids. 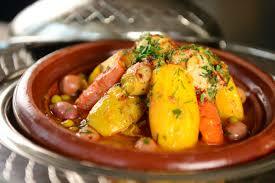 At this point you will usually add onions, garlic, spices, vegetables and any other flavoring you may like. Some cooks/recipes say don’t cover the meat & vegetables entirely. I have covered with liquid and the results are very good. Step 4-Cover the Dutch oven or pan. You can cook over a stove top or in the oven. I prefer the oven as it provides more even cooking on all sides and results in the best flavor and tenderizing. Follow the recipe for the correct oven temperature. Remember it will always be low….300-325* or less. Give ‘braising” a try….you don’t have to be a gourmet cook to enjoy a wonderful meal! Dutch ovens can either be cast iron or aluminum. Cast iron Dutch ovens can be the traditional matte black or have an enamel coating…inside and out. Stainless steel Dutch Ovens are usually enamel coated. The Dutch oven is a very versatile piece of cookware. They have a thick bottom and sides. This feature creates even heat distribution and no hot spots. Dutch ovens also have a heavy, snug fitting lid. Flavor of the food is enhanced because the heavy lid helps retain moisture. 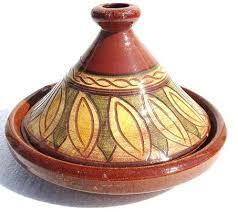 The versatility of the pot is evidence by its multiple uses. You can bake, broil, sauté, braise or roast a dish. It can used stove top on any surface or in the oven. Roast vegetables…braise some ribs…brown meat… create your favorite soup or stew. Enamel coated cookware is very attractive and can be taken directly from the stove or open to your table. Dutch ovens come in two shapes…oval and round. If you’re roasting fish, pork chops, beef or chicken, the oval shape is said to be better. I’ve read that it is also better for making no knead bread. The round shape Dutch ovens provides even heat distribution as it fit better on a round burner. It also works a little better when you have to stir soups or stews. If you’re looking to get your first, and possibly only Dutch oven, give some thought to the size. They come in a wide variety of sizes to suit your most common need. Think in terms of a one quart size is good for a one person meal. Unless you are into larger dinner parties, a five quart round or 6 quart oval pot will serve you well for most family/small party needs. My personal thoughts are that a little larger is more practical than a little smaller. · It should be cast iron. Not aluminum or other metals. · The wall and bottom thickness should be uniform for even heat distribution. · It should have those 3 stubby legs on the bottom for stability and allow a little clearance between the pot and the coals. · Lid should fit tightly to keep the heat inside. · Lid should have a raised rim so coals can be put on top for campfire baking. · Should have sturdy “bail-type” handles so you can safely handle very hot and very full ovens. I not a builder or an interior decorator...just someone who enjoys my time in the kitchen and watching those “fixer upper” and house flip shows. I’ve noticed they usually seem “standard” in the ”MacMansion” size homes. They vary in smaller homes from not having one to various sizes. If you looking at a new home or remodeling what you have, some thoughts and suggestions. First, islands can serve a single or multiple purpose. They can simply be used as additional counter/prep space or function as an eating area, serving area, cooking area or some combination of all these depending on your needs or life style. I’ve found that islands create a gathering space during for dinner parties.Large ones are usually fixed in place. Small versions can be ‘mobile’. Just some food for thought. If you found helpful or not, I welcome any comments or your own ideas. Whether we want to or have to, there may come a time when you need to cook. When I first got married…some 40 years ago…I decided to dabble in the kitchen. I worked in banking and my wife was a dental hygienist. As a result, I had the traditional Federal holidays off but my wife had only the major ones like 4th July, Christmas, Thanksgiving, etc. Being “home alone” some days, I decided it would be a thoughtful gesture to prepare a nice dinner meal when she came home from work. Like most newlyweds we had a good number of assorted cookbooks given as shower or wedding gifts. The assortment included books for the beginner or “easy meals”. Tip #1-Get one or more of this type of cookbook. If you’re like me, “a picture is worth a thousand words” and these books usually include pics so you can see your creation. Helps build confidence plus ingredients are generally straightforward and as the book implies instructions easy to follow. Tip #2-Review your pantry first and then make a shopping list for the needed ingredients. Over time, you’ll find that you will collect an assortment of spices and seasonings and just have to get the main ingredients. If you’re like me, you won’t check as often as you should and wind up with several jars of oregano, parsley, garlic powder, etc. Then you create a clutter problem. Tip #3-Once you have all your ingredients, do all the prep work first. Chop the onions, slice the vegetables, mix all the liquids, measure out per the recipe…etc. Tip #4-If you’re making a main course, one or more side dishes and maybe a sauce, check the time needed for each one. You don’t want to start a vegetable that takes 10 minutes if your chicken dish takes a 45 minutes to roast. While the 45 minute chicken is roasting, you can organize yourself for the other dishes. Tip #4-A would be to invest in more than one timer in your kitchen so you don’t get confused or forget when did I start that dish? Tip #5-Take time to set a nice table. While you don’t have to do this every day, it takes little to no effort to use those nice placemats and napkins you got as a gift along the way and the “special occasion “dishes that were wedding presents. It will make the meal more special for your spouse, friend, or guest and make you fell even better about time you spent preparing it. Tip #6- If you’re so inclined, enjoy the meal with a nice bottle of wine. These are my ideas for the beginner. 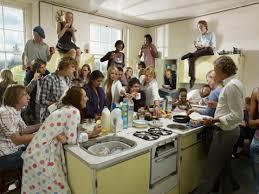 There are many others and over time as you find them, the better, and more enthusiastic a cook you will become. Besides that cooking will become easier and more economical. Some of the tips will become natural, others you may want to write down and keep for reference. Hope this helps motivate you to expand your cooking talents. I welcome any commnents from those of you who found these tips helpful...or not. An uncle on my Dad’s side of the family enjoyed dabbling in the kitchen. Don’t know what was his source of inspiration but he came up with a very simple recipe for white clam sauce that has been a favorite of ours. If you enjoy linguine with white clam sauce, then try this…. P.S….Don’t forget a nice Italian red wine and some crusty bread for dipping! Red Wine with Steak…White Wine with Fish…Maybe Not…..
A few years back I found an article in a popular cooking magazine that had a great idea for a small dinner party…..”small” because the premise can get expensive for more than one or two couples. Traditionally, we have been taught that red meat is best served with a good red wine and fish (or any white meat) is best enjoyed with a good white. The article suggested adapting those “norms” to your own personal taste. Here’s the expensive part….you set your table with 5-6 glasses of assorted wines…2 dry reds...2 dry whites… a sweet dessert wine and a champagne. Then create a multi course meal with steak..fish..chicken…each one doesn’t have be entrée’ size portions. You sample a taste of several wines with each course and decide for yourself which brings out the most flavor and enjoyment for you. I used the idea for an upscale New Year’s Eve dinner party, but I’m sure you can do the same thing with a more casual menu. Like many people when you think of cast iron cookware you may think of the matte black finish on heavy pots and pans that you use cooking in a fireplace or over an open campfire. Enamel coated cast iron cookware brings the long time features of cooking with cast iron into today’s kitchen. Enamel coated cast iron cookware is an excellent conductor of heat. As a result, it does not produce hot spots and foods will brown evenly. With enamel cast iron, the sides, bottom and lids retain heat resulting in totally even heating. It is very energy efficient. 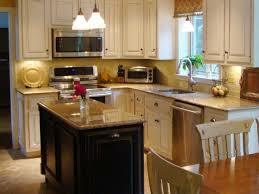 Because the enamel coating seals the surface, moisture is retained and liquid stays in the food. This enhances flavor and tenderness. Whether you want to bake, roast, sear, brown or blacken enamel coated cast iron is perfect for all these uses. Enamel cast iron is well suited for lower heat for browning and high temperatures for searing or blackening. These pots, pans, skillets, Dutch ovens all have smooth bottoms and are suitable for all types of range tops and any type of range or oven…gas, electric, induction. This cookware may be used in your oven with temperatures as high as 450*F.
If you are already using ‘traditional’ cast iron cookware, enamel coated cast iron has some added advantages. First, it doesn’t need to be seasoned. With traditional cast iron cookware, you should avoid using it for acidic foods like tomato sauces or chili. The acidity has potential to damage the cast iron’s seasoning and potentially allow iron and other metals to seep into the food. You don’t have these problems with enamel coated cast iron. Second, the smooth enamel coating prevents food from sticking and makes clean up much easier and eliminates any worry about rust. While enamel cookware is normally dishwasher safe, hand cleaning is recommended. It helps preserve the cookware’s original appearance. Don’t use steel wool or other abrasive type pads. Nylon pads or soft scrapers are best. Let the hot pot or pan cool before putting it into water for washing. The temperature shock of a hot pot in cooler water could cause cracking. If you enjoy preparing your meals with traditional cast iron cookware, then you can enhance your enjoyment using cast iron with an enamel coating. While not professionally trained, I’m more of a “culinary enthusiast” than a casual cook. 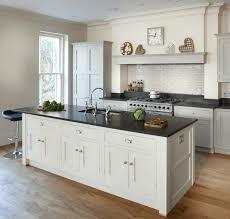 If you’re like me, you want to enjoy cooking, present an attractive table and spend more time with family and guests. For these reasons, it’s helpful to know the benefits and advantages of enamel coated cookware. Cooking at high temperatures can make food stick to plain stainless steel, aluminum or cast iron pots and pans as they don’t provide much resistance to heat Cleanup is a hassle and takes away from enjoying the time preparing meals. A second benefit of enamel coated cookware is that it resists rust as a result of the thick, glossy coating. This gives your cookware a longer useful life. Enamel cookware is known to be very durable and the outer texture is able to stop damage from the elements in your kitchen that effect cookware. We are a very health conscious society. The Internet is filled with articles giving advice on healthy eating and living. There are health benefits to using enamel coated cookware. 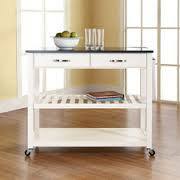 The enamel coating helps create a buffer zone between food and the metal base. The usual metal base is reactive with alkaline or acidic foods. This adds components of metallic compounds and even slight metallic taste to your food. 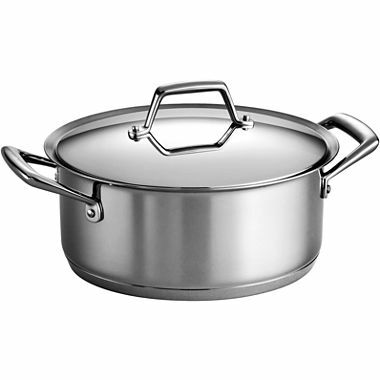 Many cooks avoid using plain stainless steel pots for cooking dishes like chili and tomato sauces. Adding to the advantages of enamel cookware is style. Today, kitchen designs frequently incorporate open shelves or cabinets with clear glass doors allowing you to display this fashionable style of cookware and add a touch of flair to your decor. 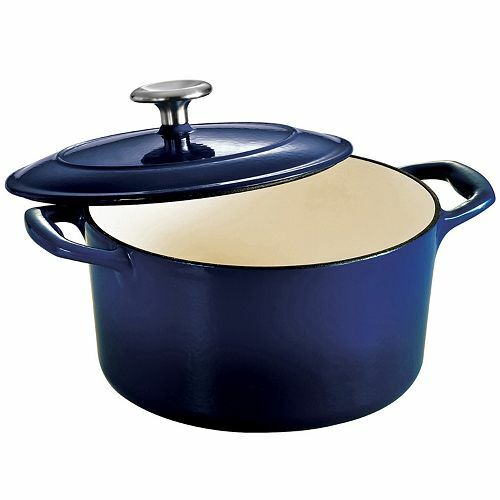 Enamel cookware comes in a variety of stylish, contemporary colors. Pots and pans come in assorted shapes and sizes. If your cooking needs are simple, you can be well served with 2 or 3 basic pots or skillets. 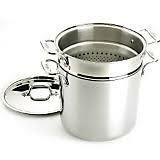 If you like to braise, roast, sauté, grill or fry, there is a perfect pot, skillet, grill pan or roaster for you. With various sizes, you can find a shallow skillet designed for grilling or a deeper skillet for frying. 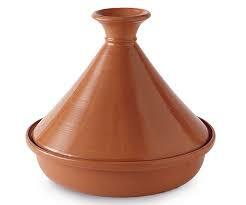 You can find larger pots for making stock or soups. Smaller ones are common for stews. Plain stainless steel, aluminum or cast iron creates a more “utilitarian” look. Also, the stylish appearance and light weight of enamel cookware allows you to take it directly from the stove or oven directly to the table. A reminder….use a trivet to avoid scorching you tale top. If you want to enhance your cooking experience then enamel coated cookware is right for you. It is one of the most popular types of cookware found in today’s kitchens. 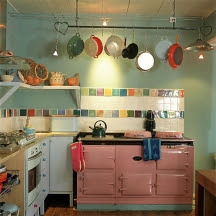 One of the benefits of enamel coated cookware that I noted in prior blogs was the attractive designs and colors of the pots and pans that can enhance the decor of your kitchen. Today, kitchen designs include open shelving and/or cabinets with clear glass doors that display your cookware and dinnerware. This is my own personal opinion and taste. While I prefer traditional cabinets and furniture, I also enjoy color. Just some ideas if you're planning to remodel or just change the style of your cookware.